"The biggest news of Comic Con International in San Diego was revealed moments ago and jaws are still on the floor—the world-renowned super hero MARVELMAN is now part of the Marvel Comics family." So reads the Marvel Comics press release posted at around 9 o'clock last (Friday) night. Someone, somewhere has finally waded through the legal tangles surrounding the character and nailed down with some confidence who actually owns the rights. As it turns out, Marvel have struck a deal with Mick Anglo, now 93, and Anglo's representatives, Emotiv Records, a Glasgow-based company who purchased Mick Anglo Limited, a company incorporated by Anglo on 21 August 1954 for the purpose of "Artistic and literary creation", possibly around the time that Emotiv Records and Products Limited was incorporated (11 February 2009). Interesting to note that, according to UK Data, an application to have the company struck from the register (not as sinister as it sounds) was made on 16 July. Emotiv's involvement with Anglo dates back to at least 2006 when Jon Campbell of Emotiv was involved in putting together the documentary about Marvelman. A website was set up in 2007 which still announces that Who Stole Marvelman a.k.a. Miracleman? is "coming soon" to DVD. "It is an honor to work with Mick Anglo to bring his creation to a larger audience than ever before," says Dan Buckley, CEO & Publisher, Print, Animation & Digital Media, Marvel Entertainment Inc. "Fans are in for something special as they discover just what makes Marvelman such an important character in comic book history." The press release quotes Mick Anglo as saying, "I did not think it would ever happen. It's a wonderful thing to see my creation finally back." At present, Marvel have officially announced the release of a Marvelman poster drawn by Joe Quesada (above) and limited edition Marvelman t-shirts. All the product announced so far has the old-style 1950s Marvelman logo. What happens next will likely be revealed over weeks and months rather than days. "This is day one," Joe Quesada told CBR. "Very few things in all my years as Editor-in-Chief and all my years in comics has thrilled me to the point that this has," says Quesada. "[Marvelman] has finally found a home where it can get published and we can see new stories... What sort of incarnation he will take within Marvel publishing? That's stuff that we'll discuss in the future." 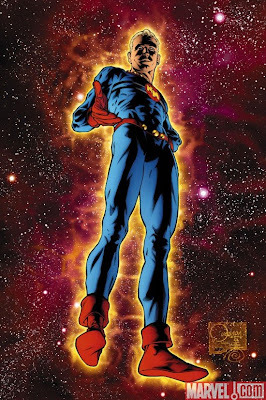 It seems clear from comments made by Mark Buckingham that not all of the creators of the Eclipse era Miracleman issues knew of the deal prior to the announcement by Marvel. "Let me put it like this: I was just told, 'It would be a good idea if you came along to the Cup O Joe panel,' and that's about as much as I knew," Buckingham is quoted as saying. However, the artist is as excited by the new opportunity as many fans are. "Obviously, for Neil and I this is a wonderful opportunity for us to finally get the material that we were doing back in the early '90s back in print again because it's been 16 years since our last issue hit the stands. Beyond anything else, we can get that stuff back in print now. There's material that was produced that's never been published, so from a fan's point of view that's fantastic. There's more Gaiman and Buckingham just waiting for printing already." I just hope this means the long out of print trades, representing some of Mr Moore's best work, will be republished. It's not about the superhero, it's the writer. Kimota! We're still a long way from having Moore and Gaiman's work back in print, though. And everyone is being scrupulously careful not to mention Miracleman, I notice. Obviously Neil Gaiman has been working closely with Marvel on this for several years, due to his doing a few things there to fund Marvels & Miracles, and you'd hope that someone somewhere has been talking to Alan Moore about all this - which he more or less said was the case last time I interviewed him. There's a few other hurdles there as well: Alan Davis, for instance, and the questions of who owns Big Ben and the Warpsmiths - Garry Leach in the latter case, apparently. It has been reported that the first thing to be published will be reprints of pre-Warrior material, which I can't imagine selling that well. The reprints of the Eclipse material will though. I can't see any creator who worked on the book wanting to be seen as the one to block the publication. I hope Gaiman & Buckingham finish their run, but I wonder how a regular monthly title will work out without them. Marvel are bound to want to do that after all. When Marvel said they had a big announcement to make on Friday I never expected this. I thought it maybe a plan to kill off Spiderman then bring him back again or something lame like that. It's good to know Marvel can still surprise you once in a while. Personally, what I'd like to see out of this development is the completion of the Neil Gaiman & Mark Buckingham series of stories. If reprints of old Mick Anglo strips are the first thing out of the gate, Marvel could kill Marvelman stone dead before he's even given a chance. They're of historical interest over here to a handful of people like me because of the occasional Don Lawrence-drawn episode but they have absolutely no relevance to an American audience. It's sixteen years since the last episode of Miracleman -- and it didn't sell that well even when it was appearing -- so a good chunk of the potential audience have no frame of reference for the character. To them, reprints of a frankly crap old strip will have them scratching their heads and wondering what all the fuss was about. The Alan Moore run incorporates and explains the old strips within its storyline and it's only once that point has been reached and re-made for the new audience should Marvel risk putting out collections of (mostly badly drawn) strips from fifty years ago. 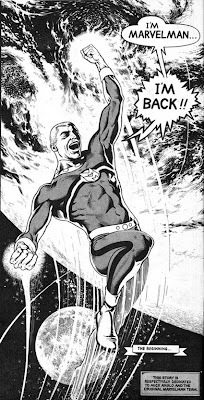 To my mind, nothing else should be done with Marvelman until deals are in place with all the creators of the Warrior/Eclipse stories and, at the very least, the Alan Moore run has been reprinted. Once that hurdle is out of the way, the character will have a fighting chance of surviving.